Meetings held with existing customers (who may or may not be able to buy from you again). Step up your investment and generate meaningful conversations with a value selling strategy, and you will walk away with highly-qualified leads. The first step is to engage attendees early with a coordinated campaign that helps you stand out from the crowd of competitors. Instead of just letting attendees know you will be at the event, and inviting them to stop by and register for a drawing, focus your messaging on the value your solution delivers. Give attendees a reason to want to learn more about how you can improve the results of their daily work efforts. Take your differentiation one step further by providing your attendees with access to an assessment tool or value calculator leading up to the show. These are great tools to help attendees identify the size and scope of their business problems. In exchange for their five to ten minutes needed to complete the tool, invite attendees to schedule a meeting or stop by your booth to see how their performance stacks up against their peers or what a full ROI analysis looks like. Promote these tools alongside every mention of your participation at the trade show. As a bonus, you will generate leads from those not even attending the show that decided to use the tool anyway, and you will start collecting rich market data about your target market’s business problems. Your outreach should include email, phone calls, and social networking. Use every channel available (in moderation) to deliver a consistent reason to stop by your booth to see how you can solve their business challenges, and the value you can deliver. Remember to also promote the event, and the assessment or value tool, on your website and social media pages. Promo items are nice but do they deliver real value? Rather, build your booth presence around the value delivered by your solution. Focus your display, signage and marketing collateral on how your solution solves your buyers’ pain points. Make available, perhaps on a kiosk, the same assessment tool or value calculator used in your pre-show marketing. The tool can be used by attendees on their own or by your booth representatives to further engage with attendees. Make sure your booth representatives are prepared to discuss the value dimensions offered by your solution with everyone who stops by. The core narrative of every dialogue should be how your solution can save customers time and/or money and/or grow sales. The all-in costs of a trade show are high. To maximize your ROI, your need to close more deals. The best way to engage with attendees is around your offering’s value. Every interaction before, during and after the show should focus on the value of solving attendees’ business problems. In doing so, you will go home with not just more leads, but more well-qualified leads. 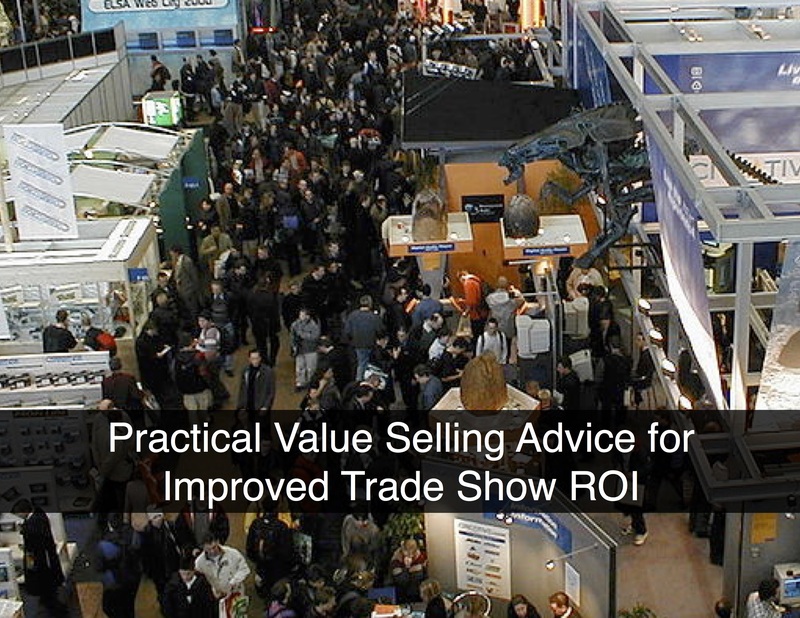 Subsequently, make sure you track these leads through your sales cycle to demonstrate the value of your trade show participation.